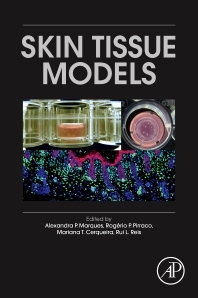 The editors have created a table of contents which frames the relevance of skin tissue models for researchers as platforms to study skin biology and therapeutic approaches for different skin diseases, for clinicians as tissue substitutes, and for cosmetic and pharmaceutical industries as alternative test substrates that can replace animal models. Alexandra Pinto Marques graduated in Biochemistry (1997) in the Faculty of Sciences of the University of Porto, Portugal, attended a one year specialisation course as part of the Biomedical Engineering Master/Doctoral Programme at the Faculty of Engineering of the University of Porto (1998) and obtained a PhD in Materials Science and Technology - Biomaterials in the University of Minho, Portugal and in cooperation with the University of Liverpool, UK (2004). She is Principal Investigator, a founder member and Vice-Director of the 3B’s Research Group, a Research Unit of the University of Minho, Portugal, where she has been build her career in the field of skin tissue engineering. She has been integrating stem cells and biomaterials knowledge into tissue engineering as a way to define innovative strategies to improve the functionality of skin tissue engineered constructs. The establishment of in vitro 3D culture platforms to understand cellular crosstalk as well to be able to modulate the engineered constructs outcome has been the focus of her work. She has been awarded successive career grants among which a Consolidator Grant from the European Research Council (2016). Rui L. Reis, PhD, DSc, Hon. Causa MD, FBSE, FTERM, member of NAE, is the Director of the 3B’s Research Group and of the ICVS/3B´s Associate Laboratory of the University of Minho. He is also the CEO of the European Institute of Excellence on Tissue Engineering and Regenerative Medicine, the Global President of the Tissue Engineering and Regenerative Medicine International Society (TERMIS) and the Editor-in-chief of the Journal of Tissue Engineering and Regenerative Medicine. He is a recognized World expert, with almost a 1000 published works and more than 25000 citations to his work, in the development of biomaterials from natural origin polymers and their use in tissue engineering and regenerative medicine, and in controlled drug delivery, in many cases in combination with different types of stem cells. He has been awarded many international prizes and is the PI of projects with a budget totalizing more than 40 million Euros. Rogério P. Pirraco (born 1982 Porto, Portugal) concluded his four year-graduation in Applied Biology in 2005, at the University of Minho and his PhD at the same university in 2011. During his PhD, he spent a total of one year at Professor Teruo Okano’s Institute of Advanced Biomedical Engineering and Science of the Tokyo’s Women Medical University in Tokyo, Japan, where he acquired knowledge in cell sheet engineering and its application in animal models. In 2016, Rogério got a 5 year FCT IF contract (career development grant from the Portuguese Science and Technology Agency) that will allow him to pursue his research interests in an independent way. Currently, his research interests are focused on the use of cell sheet engineering, stem cells and hypoxia for Tissue Engineering strategies. Mariana T. Cerqueira (born in 1983 in Porto, Portugal) concluded four years graduation in Biology (2006), in the Faculty of Sciences of the University of Porto, performing a final work thesis at Stem Cell Laboratory, King’s College London, UK, where she got the opportunity of the first contact with the latest cutting edge research. She carried out her academic career by joining 3B’s Research Group, University of Minho, where she concluded a PhD in Tissue Engineering, Regenerative Medicine and Stem Cells (2013), as the first graduated student in the field of Skin Regeneration in the group and where she has been working since then. After concluding a Post-Doctoral fellowship awarded by Portuguese Foundation of Science and Technology, Mariana currently works as an Invited Assistant Researcher. By taking advantage of the knowledge acquainted during graduate studies and novel collaborations established, she has been focused on the development of different skin tissue engineering strategies by exploring mainly stem cell-based approaches to fine tune their role in different types of wounds. She has been publishing several works in refereed journals, awarded two front covers in international journals, and in international conference proceedings.